There is a new in-depth post on park-and-ride at the Australian public transport blog, Transport Textbook. Author "Loose Shunter" (ahem) asks "What role for Park and Ride in an integrated public transport system?" He or she takes a detailed look at park-and-ride policy in Melbourne and Perth in Australia and Vancouver in Canada, highlighting contrasts in their approach. To my mind, Vancouver does best. It doesn't abandon park-and-ride altogether but does not let it undermine transit-oriented development opportunities, feeder bus services and the environment for walking and cycling to stations. Melbourne's approach is at the opposite end of the park-and-ride spectrum. 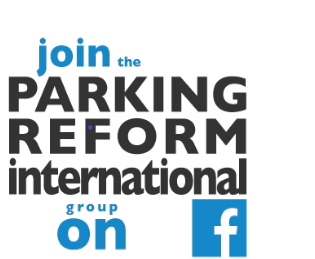 The essay discusses many of the arguments for and against providing car parking at stations. The post also has a good bibliography for anyone who wants to dig further. Reinventing Parking readers may remember that I have urged a skeptical approach to park-and-ride in dense, inner-urban transit station areas. This applies to many stations of most of Asia's growing mass transit systems. So I was interested to see Transport Textbook's take on park-and-ride in much lower-density metropolitan areas with more automobile-oriented suburban landscapes than in Asia. Below are some highlights from the Transport Textbook post. The whole thing is worth a look. Hamer (2010:52) questions the effectiveness of Park and Ride as a generator of mode shift to public transport, with some studies cited claiming that Park and Ride ‘cannibalises’ existing patronage from feeder buses, walking and active transport and attracts people to driving to the station rather than using more sustainable modes. Mees (2010:174) offers the Doncaster bus Park and Ride in Melbourne as an example, where a survey found the facility’s opening in 2004 had drawn almost all its users from those who formerly used public transport for their entire journey. Mees (2010:174-5) questions the lessening of environmental effects from the shorter car trips generated by Park and Ride journeys, claiming cold engine starts and short journeys may produce as much pollution as longer, door-to-door car journeys. He also critiques Park and Ride as not providing a real alternative to car use, serving only peak-period, peak-direction CBD trips on radial rail and bus networks. Thus, Park and Ride does not serve off-peak or non-CBD trips effectively. He argues that the size of a city’s Park and Ride stock is inversely related to that city’s ability to grow public transport patronage (Mees 2010:94). The role of Park and Ride in the Perth rail system is to extend the network’s catchment beyond walking distance from the station. This is particularly important on the newer Mandurah and Joondalup lines, where most stations are located in the freeway median with very limited walk-up catchments. 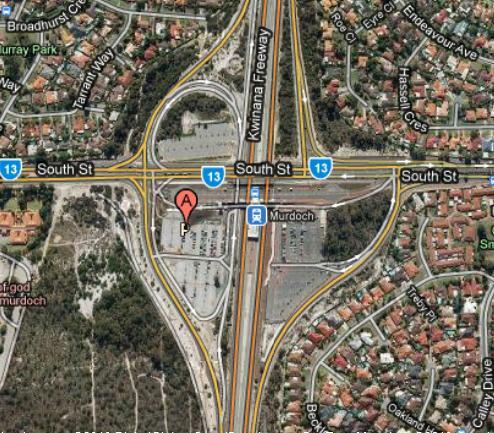 Murdoch Park n Ride south of Perth on the Mandurah rail line which runs here in the Freeway median. But on Perth's other rail lines there is some conflict between the public transport agency, TransPerth, which wants to keep park-and-ride, and other agencies that want more Transit-Oriented Development (TOD). Some of Perth's park-and-ride spaces are priced, using pay-and-display at A$2 per day. Park and Ride has been an important element of public transport planning in Melbourne for over 40 years. The Victorian Government has invested heavily in Park and Ride facilities across the metropolitan rail network since the 1970s. Park-and-ride in Melbourne has been criticised by Paul Mees among others, as being a wasteful subsidy for car users, as reflecting the failure to integrate rail with feeder modes, and for having a large opportunity-cost. The Melbourne authorities seem highly committed to the policy and determined not to price the spaces. The Victorian Government and rail operators have sent strong signals over many years that Park and Ride is a free resource to rail users. In fact, the most recent franchise agreement for the metropolitan rail network ensured that the operator would not price the use of Park and Ride facilities (Department of Transport 2009:106). ... long-term policy to restrict supply of Park and Ride to the outer ends of the network to maximise public transport use and promote Transit-Oriented Development (TOD) opportunities around inner- and middle-suburban stations. Much of the parking at mass transit stations in Vancouver is priced (at C$3 per day or C$60 per month). In Vancouver, park-and-ride is therefore a complement to the other modes of accessing stations and does not dominate or undermine them. Park-and-ride is not a feature of most of its stations. Do take a look at the Transport Textbook post. Thanks for your kind words regarding my post on Transport Textbook. I think Vancouver is the only city that has developed the right policy formula combining supply constraints (limiting park and ride spaces to the outer ends of the network), demand management (pricing park and ride) and a credible public transport alternative (fast, frequent feeder buses) to deal with the park and ride issue. Perth is getting there, but still sees Park and Ride as a key part of the mix for rail users to reach the station from beyond walking distance in a low-density urban environment. Melbourne on the other hand uses Park and Ride as a proxy for decent bus services to extend the reach of a largely walk-up rail system. By the way, Loose Shunter is a nom de plume to keep work and blogging separate. Park and Ride has been an important element of public transport planning in Melbourne. park-and-ride is therefore a complement to the other modes of accessing stations and does not dominate or undermine them.